This lovely apartment in Barcelona, located in the heart of the Eixample district of Barcelona, has been recently fully renovated and offers 3 bedrooms, 2 bathrooms, a large living room and a beautiful sunny gallery with views of Diputación street and the Rambla de Catalunya, one of the most exclusive streets of the city. The apartment comes fully equipped with all the amenities needed to make your stay comfortable and has a fully modernised kitchen. It’s located in the Habitat Apartments Rambla Deluxe building, along with Rambla Deluxe B. Nice spacious apartment in fantastic central location. Metro is very close, only few minutes from the apartment.You can reach the waterfront within 20min walking. A lot of restaurants and bars nearby. And the bakery down was excellent. In kitchen we found small package with salt, oil, sugar - we appreciated this a lot! Only disadvantage is the noise from the street (during weekend almost all the night) and the smell of fresh window paint.- Habitat Apartments Reply: Dear Gabriela, thank you for the time spent to review our apartment. We are really happy that you could take advantage of our apartment position. At the meantime we are sorry that your stay coincided with some maintenance work. Looking forward to welcoming you again. Thank you! The apartment Rambla Deluxe A is located in Rambla Catalunya area. The apartment is located on Rambla de Catalunya Street with Diputación street, in the Eixample district, which is best known for its architecture, exclusive boutiques, restaurants and coffee shops. It is only 3 minutes away from Paseo de Gràcia. 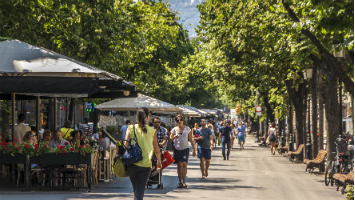 Also walking distance you can find Gran Vía de les Corts Catalans, an important avenue, as well as Plaza Catalunya, the Ramblas and the Gothic Quarter. Metro stop - 434 m.
Casa Batlló - 0.26 km. Paseo de Gracia - 0.31 km. Plaza Universitat - 0.47 km. Lovely appartment, very clean and nice little extras such as washing up liquid, kitchen roll etc all there. The gentleman who met us there was also very friendly and helpful. Would definitely recommend, although the windows do not block out much noise somits quite noisy during the night. Although thats the only negative-- Habitat Apartments reply: It is always a pleasure to know that our guests are satisfied with our apartment and services. We are looking forward to welcoming you back to our Apartment in order to provide you with the experience that you deserve. Thank you! We were 3 couples, and we really enjoyed the apartment. It was very spacious and in a fantastic location. The bakery downstairs was very handy and affordable for morning coffee and also sandwiches and salads. The large table was great for group planning (and meals if you cook at home). We had some concern about the eashwr, so Habitat sent a technian to check it. (Later we did find instructions in a drawer, but I think Spanish only). We had a wonderful experience staying at Rambla Deluxe A. All the staff were so helpful and friendly. The apartment was just perfect for our family of 5. The guest shower did not drain well but everything worked well. The 24 hour line was very helpful to us. One time, we had an issue with the safe and we were able to resolve it. We also appreciated that your office kept our luggage on the way back from our cruise. Staff was so helpful in guiding us for the day. Loved our experience! The apartment is great. Big, clean, beautiful. Top location. Digno de recomiendar. Brinda la sensación de estar en la casa propia. This is the 2nd time staying in this apartment and hopefully won't be the last! It's clean, spacious and modern with comfortable beds. Location is great, with much nicer restaurants than the more touristy end of La Rambla. It's less than 5 minutes walk from the airport bus and all the shops including an organic supermarket on the same street. There is a bakery underneath the apartment plus the guy on reception is very friendly and helpful. Highly recommend both the company and the apartment. Great apartment , great location. Lots of space , Ideal for our family of 5 . The only negatives were the towels which were in very poor condition and need to be renewed .Towels aside everything was perfect . You get what´s displayed. Very nice, modern & functional apartment in a prime location. Beautiful apartment in a great location. The lock/key situation was very frustrating. Way too difficult. Also, shower in master bath did not drain. Virtually no instructions from the rushed check in procedure. Wir waren 2 Nächte dort und das Appartement war schön, zentral gelegen und groß. Zu 5 hatten wir genügen Platz für alle. Es liegt an einer sehr befahrenen Straße aber das kann mal locker in kauf nehmen in einer Stadt. The location is excellent. It is very spacious and quiet. The central air conditioning work really well. The management is wonderful, always response to my email. Need small knife in the kitchen, trash cans in the bathrooms and soap/shampoo inside master bedroom shower. Some of the towels are quite old especially the extra sets we paid for looks very grayish instead of white. Need instruction and regular maintenance for the washer and dryer. The dryer is not working at first because of moisture. Really nice appartement, well located but a bit expensive. Excellent apartment in excellent location. Apartment appears to have been remodeled recently. AC works well, easy access key system. Young lady who met was on time, very pleasant and informative. My husband and I traveled to Barcelona with our 2 young adult children. We found the apartment to be quite large and very comfortable for our family of 4! The location was great as it was close to the popular Las Ramblas as well as to great shopping on the Passeig de Gracia. Easy walking to the waterfront and inexpensive taxi rides for when our feet were too sore to walk. We would highly recommend this apartment! Very good Apartment butnoisy. Very spacious and central location. Everything said about the apartment was true. The location was great and the stay was perfect. Clean and everything we could possibly need. The host was there to meet us and explained everything to us. Great. Beautiful apartment with gorgeous decor. Everything we needed and so much space, it was also very clean and airy. The location is fabulous and we would highly recommend staying here. It's a lovely area and we felt safe, I have stayed at the more touristy end of La Rambla and this was much better, friendlier people, no stag nights and beautiful shops and restaurants. We were very impressed with both the apartment and the company! Lovely apartment -very clean, everything you could need although some mugs would be useful. Great location for walking into placa catalunya & ramblas or up Passaig de grassia Habitat very good - quick response to problem with the safe . We would have preferred to leave cases in apartment on last day rather than trail up to the office - but staff there very helpful also. Our stay in this apartment was at the high standard that we consistently have from Habitat Apartments. Had a positive experience from beginning to end. The wifi however was extremely slow. After contacting Habitat we got a very promt response that the router would be restarted however we also found out that it was in another apartment. This would explain why it was barely working in ours. Nevertheless it was a great stay. We stayed in this apartment in June 2015 and I was very impressed. It was the best accomodation of our 4 week holiday. It is super spacious, very modern and centrally located, yet quiet. I would highly recommend it as a place to stay. Great apartment. Very spacious. Close to bars, restaurants and main shopping strip and the well known la Rambles. It would be beneficial if habitat could provide tourist info of local supermarkets as these were difficult to find and an essential part of apartment living is to find basic groceries. Washing machine operating instructions would also be an added help. Really lovely apartment, which made our stay in Barcelona even more special, staff there to meet us on time with keys and showed us around apartment. Very nicely decorated, comfy beds and fresh linen, hot showers and air conditioned. Excellent location with good restaurants and Tapas bars near by. Just a few suggestions - tea pot and a few large serving bowls would have been useful. The apartment is ideally situated for shops, cafes and restaurants. It's bright and spacious and very nicely decorated. A great apartment for a group of friends to share. It had everything we needed apart from enough mirrors. A full-length mirror in each bedroom would have saved the polite jostling for the bathroom mirror when six women were getting ready to go out. Otherwise, perfect! Thank you. Great location . Very nice and comfortable apartment.Excellent to stay with older children. I missed a copule bed in the main suíte. Should not have only single beds in all bedrooms.For the apartment level should also have a Nespresso machine and few capsules as a welcome gift. Hi, This is an excellent apartment in a very good location. Just 10 minutes from Placa d' Catalunya with the tourist bus, airport bus and the supermarket in the basement of Cortes de Ingles. Not to mention lots of nice restaurants. Would happily recommend. Apartment was spacious, clean and well-appointed. Great location! Service was also great - friendly and responsive. Would stay here again, and hope to soon! This is an excellent luxury apartment in an ideal position in Barcelona. The apartment is large with high quality fittings and furnishings and excellent security. It is very quiet with the windows shut and has a good air conditioning system. I strongly recommend this apartment. A few things were not quite right during our stay: the safe was locked and couldn't be used despite us being told it would be fixed when we arrived, the front door is difficult to open, and a number of globes blown. / Habitat comments: thank you for your comments. We are sorry we could not fix the safe and will take a look at the lamps and the front door. The Appartment was very nice, clean and big. We stayed in the apartment during the last week in August and found it very clean and comfortable. It is ideally situated in the heart of Barcelona so we were able to walk everywhere. We had an excellent stay. Charming and spacious apartment, nicely located in centra Barcelona. Close to metro and major attractions. Supermarket is not very close, so be prepared to walk quite a bit if you want to get food to cook. We had an issue with the safety box which I had trouble getting resolved even after calling multiple times. I reverted to Google and found a video showing how to unlock it when you lost the code (not very safe - but at least I recovered our 5 passports!). // Habitat Apartments comments: We apologize for the inconvenience and we are finding out what happened to the problem about the safe box. We will contact you as soon as possible. Thanks for your comment. Great Location and very spacious apartment. EAsy access with lift to the apartment. Stayed with a family of five and found the apartment to be very large and have everything we needed. Walking distance to everything!!! Great bakery downstairs and cafes on your doorstep. Perfect apartment, perfect facilities, perfect location - everything great. We want to come again. Having stayed in BCN several times over several years, I only wish I had found your company a long time ago. I can not speak highly enough of your service and choice of appartments. I'll be back. Internet was being updated and dish washer hadn't been emptied from previous visitors. but still not a problem, will recommend to friends and colegues alike. Phil. The apartment was great for a family stay, great location, comfortable and spacious with good facilities. We did find that the kitchen was a little under equipped to cook and serve meals for a family. It is a great kitchen but does not have everything you need to make meals i.e. knives, chopping boards, mugs, serving bowls, more drinking glasses etc. Also we would have preferred a double bed in the main bedroom instead of singles. Overall a great apartment and we would def. stay again. Habitat Apartments: Thank you for your comment, we are going to check what is missing in the apartment and buy some new kitchen tools. Prachtig en ruim appartement. Het ziet er het zelfde uit als op de foto's. Onder appartement zit bakker en mini-buurtsuper. Ideale ligging. Vlakbij Casa Batllo en metro. Ramblas ca. 10 minuten lopen. Very Nice stay, appartement à little bit noisy. Apartment proved an excellent base for touring Barcelona. Fantastic apartment,located 5 mins walk from Plaça Catalunya. 3no. double bedrooms with 2 single beds in each. Great location, 10 mins walk to La Ramblas. Highly recommended if you are in a group of 3-6. Bakery downstairs. Only comment for Habitat is that 1 shower door is missing a handle from the toilet (off the main corridor). Lovely apartment and decor. Great location but apartment was very noisy due to traffic outside, but that is expected in such a central location. Beds could be better quality, and would recommend either zip lock twins, or bed feet that locked as they had a tendancy to wander around the room! Very clean apartment but entrance hall to both apartments had bags of dirty towels and sheets left there by the cleaners for our entire stay. Very nice, clean and spacious apartment. One of the rooms are a bit dark and doesn't have a "real" window, but the rest is perfect. Very good service from Habitat. This apartment was in a perfect location. Just around the corner from the metro and in the middle of lots of shops and restaurants. We had plenty of room for 6 (two adults, three teenagers and a nine year old) and the A/C worked great in the July heat. The only negative I have is the thin windows. There wasn't much noise at night but you could hear sounds on the street. We were delighted with this fabulous apartment right in the heart of Barcelona. The amount of space was a surprise and delight and all the furnishings tasteful and comfortable. The location cannot be beaten and the service both at check-in and from the recommended airport transfer company could not be faulted. We will definitely be back. Fabulous apartment! Clean, spacious, modern, good design, great location. Perfect all around. Very nice and clean apartment. Location is perfect and very close to 2 metro stations. Lots of restaurants close by. We were 4 adults and 2 kids and the apartment was very comfortable. Fantastisch appartement in een mooie stad. Stylish clean and spacious apartment in a fantastic location! A lovely apartment in the most fashionable district made our stay perfect. Well appointed furnishing, and spacious rooms were just as depicted online. Easy to work with Habitiat from start to finish. An excellent choice to stay in central Barcelona. Terrific place. Clean. Comfortable. Great location. Stunning location to all the highlights of Barcelona. Very accessible to Metro, busses, trains and Taxis. I traveled with my two kids, age 12 and 10 and could not have felt more safe in this apartment. The only negative was general street carousing into the wee hours but hey, this is a fun, busy city! Was not a big deal. The exchange of money and keys was quick and professional. The apartment was super clean and tidy with lots of kitchen supplies for cooking in. Would stay again for sure. The apartment was great with the exception of the fact that the hot water did not work for a few hours. // Habitat Apartment : We are sorry for the inconvenience, we have taken care of this problem. Excellent emplacement appartement très agréable très moderne spacieux ; bémol : connexion internet n'a été disponible que le dernier jour de notre séjour. A great apartment, recently renovated and in brilliant location for exploring Barcelona. Very large and equipped to a high standard, will easily accommodate 4 adults and two children / teenagers. Unfortunately previous occupants have not respected the property so there were a few minor faults and scuffs, but nothing unusual with a family friendly property. Loved the space and independence and will now have to think hard before staying in a hotel room again! Very nice appartment, newly renovated in a great location. Located on Rambla de Catalunya, this apartment in Barcelona is on one of the most exclusive & chic streets. It offers a modern new place.